Getting more visitors on your website is a very complex process with a lot of variables good SEO, great content, advertising etc. One of the latest trends in design-related websites is the community news feature. Most design news use it now and it can be a very effective way to increase the number of visitors on your website. When Digg.com initially releases their Digg badges, it simply became widely implemented in blogs and websites who wish to endorse their articles up to Dig front page. This accomplishment of badges slowly evolves, webmasters and bloggers began to add more badges and mini icons of diverse bookmarking sites like Delicious, Reddit, Design Float, Stumble Upon etc. Then some blogs (including us) want to make things a little bit nicer. Instead of placing it next to the title, it’s moved down, right underneath the last paragraph of an article. Together with some design, we thought it will be attractive sufficient to grab visitors attentions. How a Social Share Box helps? Share box recommendation readers and visitors to present articles they think are good to bookmarking sites. The thought of a Share box is simple – essentially consists of a simple background and couple of bookmarking sites links (article permalinks embedded). 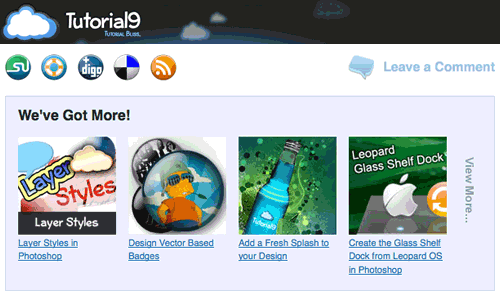 Let’s first take a look at 12 nice designed Share boxes we have many social bookmarking websites. Folks at BlogPerfume wrote a simple and nice article on how you can design a simple and nice Share box box (they call it the Bookmark box) from scratch in Photoshop. 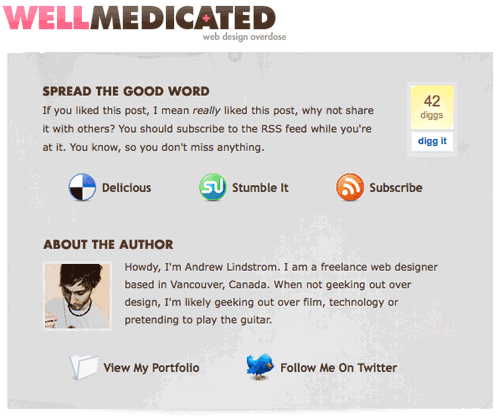 Stumble Upon buttons – Choose your fav SU buttons and create your very own scripts for your site.